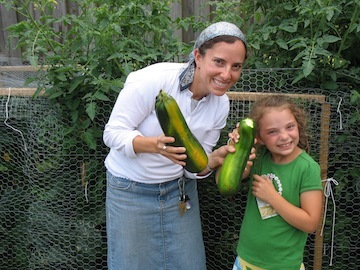 I once heard second hand that a rabbi advised that every kid should have a garden. In our fast-paced, digitized culture there is a lesson for children that can only be learned from a garden. Plant a seed, put a little bit of effort into it every day and in a few months you will literally enjoy the fruits of your labor. Gardening is really about trial and error–and asking the experts. We’re still sorting things out, but we manage to enjoy a few exciting successes each year (like these zucchini squash last year). It’s not too late to start for Chicago, and lettuce and herbs are especially easy to grow–even in a sunny window. We enjoyed a salad with our lettuce and the season’s first tomatoes today. A tomato straight from the garden makes you realize why it’s a fruit. That dressing sounds great! Going to try it tonight for dinner.